Louise Bourgeois was born December 25, 1911 in Paris to Louis Bourgeois and Joséphine Fauriaux. The family, including Bourgeois’s older sister, Henriette, lived on Boulevard Saint Germain, where Louis and Joséphine continued the Fauriaux family antique business by opening a tapestry gallery. In 1913, Bourgeois’s brother Pierre was born. In 1919, the family acquired a property in Antony, a suburb of Paris, which included an atelier for the restoration of tapestries. It was also around this time that Bourgeois’s mother, Joséphine, contracted the Spanish flu, from which she never fully recovered. Winters were spent in warmer climates, and Bourgeois’s education was frequently interrupted to help care for her mother. In 1922, the British au pair Sadie Gordon Richmond entered the Bourgeois family to teach the children English. Living with them for almost a decade, Sadie also became Louis’s mistress. This entangled situation, and the effect her father’s behavior had on Bourgeois, would later find expression in her art. Bourgeois’s childhood memories, her involvement in the family tapestry business, and the caregiving she provided her mother—along with pervasive feelings of abandonment—would become important themes in her work. 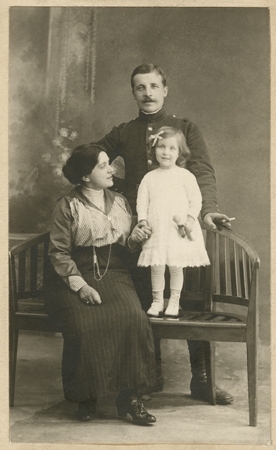 Bourgeois’s mother died in September 1932. In November of that year, after receiving her baccalaureate in philosophy from the prestigious Lycée Fénelon in Paris, Bourgeois entered the Sorbonne to study mathematics. However, profoundly depressed by her mother’s death, she soon turned to art. Bourgeois attended several different academies and artist’s ateliers in Paris, and took classes at the Académie de la Grande-Chaumière, the École des Beaux-Arts, and the École du Louvre. During this time, she also studied with Fernand Léger, who told her that her sensibility leaned toward the three-dimensional. In 1938, Louise Bourgeois met and married the American art historian Robert Goldwater and moved to New York City, where they raised three sons. Soon after her arrival in New York, Bourgeois enrolled at the Art Students League, where she began to make prints, and in 1945, she had her first solo exhibition of paintings at the Bertha Schaefer Gallery, New York. 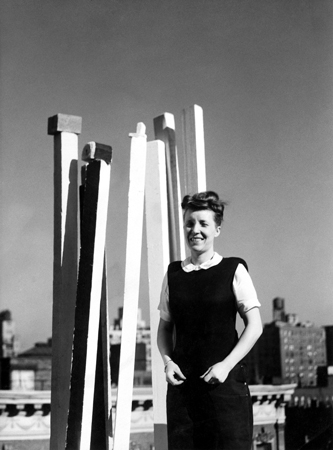 She began creating sculptural forms out of found wood on the roof of her apartment building, Stuyvesant's Folly, in the mid-1940s. In 1949, Bourgeois exhibited this work for the first time in a solo show, Recent Work 1947–1949: Seventeen Standing Figures in Wood, at the Peridot Gallery, New York. Two more solo exhibitions at the Peridot Gallery would follow in 1950 and 1953. In 1951, the Museum of Modern Art acquired Sleeping Figure (1950). Throughout the 1940s and 50s, Bourgeois’s work was presented with Abstract Expressionist artists, including Jackson Pollock, Mark Rothko, and Willem de Kooning, in various group exhibitions. She was in contact with European artists in New York such as Marcel Duchamp, André Breton, and Joan Miró. In 1946, Bourgeois began making prints at Stanley William Hayter’s Atelier 17. In 1947, she produced a seminal print project, He Disappeared Into Complete Silence, in which nine engravings, accompanied by her parables, were distinctly architectural in theme. After the unexpected death of her father in 1951, Bourgeois fell into a deep depression, which led to her psychoanalysis with Dr. Henry Lowenfeld. In 1964, after a period of relative seclusion, she had her first solo show in eleven years at the Stable Gallery, New York. Her new work, made in plaster and latex, revealed a turn toward more organic processes, and introduced the “Lair” as a unique sculptural form. In 1966, Lucy Lippard included Bourgeois’s work in the seminal exhibition Eccentric Abstraction, together with a younger generation of artists like Eva Hesse and Bruce Nauman. In the late 1960s and early ’70s, Bourgeois frequently traveled to Italy to work in marble and bronze. CONFRONTATION (1978, Coll: Guggenheim Museum, NYC). Bourgeois’s husband died in March 1973. In 1974, she created The Destruction of the Father, which was shown for the first time in a solo show at 112 Greene Street that same year. 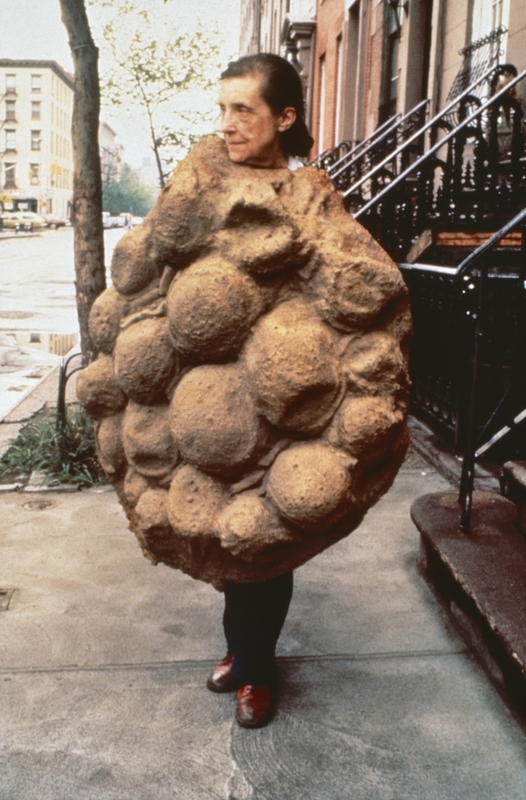 In 1978, she staged a performance (A Banquet: A Fashion Show of Body Parts) within her first spatial environment, Confrontation (1978), at the Hamilton Gallery of Contemporary Art, New York. In 1980, she met Jerry Gorovoy, who included her in a group show he curated at the Max Hutchinson Gallery, New York. Gorovoy would subsequently become her full-time assistant and remained a constant presence for the rest of her life. Louise Bourgeois: Retrospective opened at the Museum of Modern Art in 1982. Curated by Deborah Wye, it was MoMA’s first retrospective devoted to a female artist. In 1989, the first European retrospective of Bourgeois’s work opened at the Frankfurter Kunstverein, organized by Peter Weiermair. In 1980, Bourgeois had acquired a bigger studio space in Brooklyn, and at that time began to create increasingly large-scale works. In 1991, she showed the first of a new series of work, the Cells, at Carnegie International in Pittsburgh. A year later, she took part in Documenta IX, and in 1993, she represented the United States Pavilion for the 45th Venice Biennale. In 1994, Bourgeois installed her first large-scale Spider at the Brooklyn Museum. 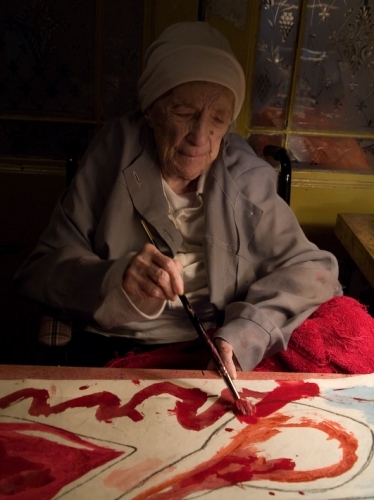 Louise Bourgeois with her hand colored print, MA FAMILLE, in progress in 2009. In 2000, following a decade of international exhibitions and awards, the Tate Gallery of Modern Art commissioned Bourgeois for the inaugural installation of the museum’s new location at the Turbine Hall of the Bankside Power Station. She presented a thirty-foot steel and marble spider, Maman (1999), and conceived three steel architectural towers titled I Do, I Undo, and I Redo (1999–2000). The following ten years continued to bring Bourgeois acclaim. She was the subject of numerous major exhibitions, including the first showing of a living American artist at the State Hermitage Museum in St. Petersburg, in 2001, curated by Julie Sylvester. In 2007, another major retrospective of her work was organized by the Tate Modern and the Centre Pompidou. Curated by Frances Morris, Marie-Laure Bernadac, and Jonas Storsve, the exhibition traveled to the Solomon R. Guggenheim Museum, New York, the Museum of Contemporary Art, Los Angeles, and the Hirshhorn Museum and Sculpture Garden, Washington, D.C.
Bourgeois was named Officer of the Order of Arts and Letters by the French minister of culture in 1983. Other honors included the Grand Prix National de Sculpture from the French government in 1991; the National Medal of Arts, presented by President Bill Clinton in 1997; the first lifetime achievement award from the International Sculpture Center in Washington D.C,; and election as a fellow of the American Academy of Arts and Sciences. In 2008, the French Legion of Honor medal was presented to Bourgeois by President Nicolas Sarkozy in the artist’s Chelsea home. On May 31, 2010, Louise Bourgeois passed away at the age of 98.